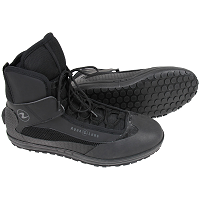 The Aqua Lung EVO3 boot was designed in conjunction with the military for use on wet, slippery decks, finning for swimming and running on wet rocky shores. Building on nearly two decades of military use, the EVO4 represents the next step in performance diving footwear when navigating rough and slippery terrain. The Vibram ® Megagrip Sole™ provides the foundation of the EVO 4’s unparalleled grip on wet or dry surfaces, rugged longevity, and optimal ground adaptability. The mid height, low profile, rapid lace up design offers solid support yet still fits a majority of fin pockets to allow for varied finning styles and superior comfort. Designed to mate with the Aqua Lung Fusion Drysuit, the 2 layer Fusion boot sets a new standard in dry-suit comfort and performance. Only for use with Fusion Drysuits. 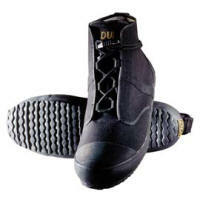 DUI was the first to develop a drysuit boot providing better durability, support & traction. 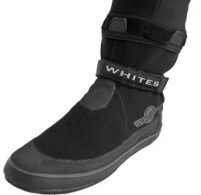 Standard on all DUI drysuits, RockBoots can be worn with any wetsuit when combined with a wet sock. A must for any diver who walks, hikes or climbs to a divesite - even great on boat ladders! Size Range: DUI has always prided itself on being able to fit the widest range of divers. 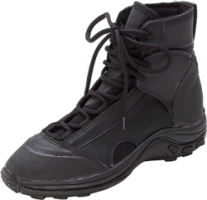 Therefore DUI has RockBoots in sizes 4 – 15. For most divers, this is the actual size that they wear. DUI has already taken into consideration that the diver will be wearing insulation. DUI introduced a new innovation called RockBoots. It was an entirely new concept giving divers superior durability, traction, support and comfort for their feet. Whether you are a shore diver doing beach entries or a boat diver climbing up a ladder, RockBoots became a staple in the drysuit divers’ diet!